On Nov. 13, Sam Houston State University alumna Angie Wilson will return to campus to share her experiences at SHSU and her journeys since graduating as part of the Student Advising and Mentoring Center’s Grassroots speaker series. She will be joined by three other alumni—Mauricio Rivas, Joanna Tucker and Juanita Garcia. The fact that they’re all alumni is only one of the things they have in common; another is that while at SHSU, all four were part of the university’s Ronald McNair Post-Baccalaureate Achievement program, a program Wilson calls an “invaluable” experience for her. 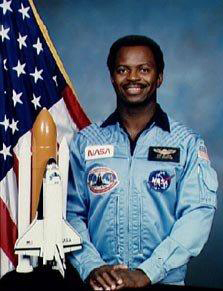 Ronald McNair, the physicist and NASA astronaut for whom the national McNair Scholars Program was named. Since its inception in 2003, the McNair program—which is designed to provide undergraduate students with effective preparation for doctoral study—has helped nearly 300 students work toward their goals. This year, as it came time to renew funding through the U.S. Department of Education, budgetary issues were at the forefront of concern. “This funding cycle in particular was quite competitive, as they cut 70 programs out of 200,” said Lydia Fox, McNair program director. But success stories such as Wilson’s was, in part, among the reasons SHSU’s funding was renewed, and the program has received, for the third funding cycle, a $1,155,000 allotment to help students like her over the next five years. “We have excellent statistics,” Fox said. “In the nine years since the inception of the McNair program here at SHSU, 85 students have obtained their bachelor’s degree. Of those 85, 63 have enrolled in a master’s program (74 percent), 33 have obtained a master’s degree (39 percent), and 16 have enrolled in a doctoral program (19 percent). Wilson was the second McNair scholar to obtain her doctorate; the first was Sara Spikes at A&M. Three McNair graduates have also gone on to obtain professional degrees, including one in law, one in dentistry and one in medicine. “We have what is called ‘best practices’ in our plan of operation—the way we operate our program—in preparing our students for doctoral study,” Fox said. “We make sure that our students are competitive for doctoral study and that we provide support for them while they are in their doctoral programs by staying in touch with them. “We do that by developing personal relationships with them and their families while in the program. Now in its 10th cohort, the McNair program accepts 10-12 students per cohort to maintain at least 28 active students each year. A member of the first cohort of the McNair Scholars Program, Wilson said the program helped her to see that obtaining a doctorate was within the realm of possibility. For more information on the McNair Scholars Program, call 936.294.3264 or visit shsu.edu/~mcnair.